Flash Gordon, the swash-buckling, all-American hero who's been saving Earth and the Universe from mad men, megalomaniacs and Ming the Merciless since 1934, is perhaps science fiction's most enduring super-hero icon, as well as being the inspiration behind Star Wars, the muse to rock supergroup Queen, and star of his own cult 1980's movie! 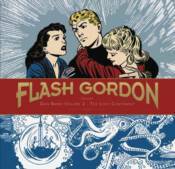 Continuing the 1950s rebooted version of Flash Gordon as revitalized by the legendary Dan Barry. Collecting together the daily strip material from October 26, 1953 to October 29, 1955.